2014 Wedding Photography Giveaway — Winner! Before I jump into naming the winner, I have to say that I read each and every entry multiple times. I loved them all. I had H read the entries too, because it was so hard to pick only one. Your stories were beautiful and wonderful. I laughed and I cried. Last night, as I paced back and forth, talking over all the entries with H, I thought I was going to have to pull one from a hat. And while I loved every story and every couple, there was one I kept coming back to: Laura & John. While I loved their Pay it Forward story, what I kept going back to was this line from Laura, “we each get to marry our best friend, and that is an incredible gift that I will always be thankful for”. 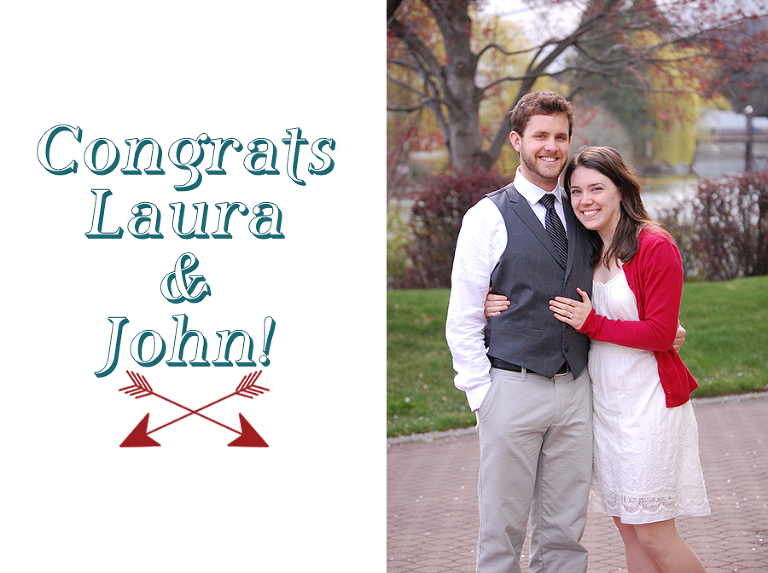 Laura and John are getting married at St. Al’s in July and I can’t wait! To everyone who entered the giveaway, thank you! You are all wonderful and if I could, I would give each and everyone one of you a wedding.